This last trip was varied and fun. Here's an appreciation for ANDY DITZLER and his marvelous "Film Love" series at Eyedrum. Atlanta's Creative Loafing magazine gave it a blurb, and the show was well attended. I also loved the students at Columbus State University, who were hardworking and appreciative during our afternoon workshop. How does the urban milieu serve our need to explore and wander, to be at once alone and in company? For the last 20 years New York filmmaker Mark Street has found himself drawn to cities. To him the city offers endless possibilities, surprises and contradictions. Tonight he presents works that update and expand our definition of the urban landscape film. 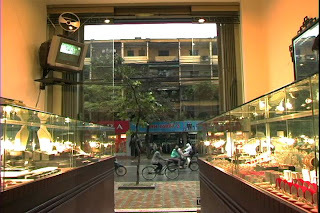 Fulton Fish Market (12 minutes, 2004) is an abstract portrait of a teeming urban market, A Year (26 minutes, 2006) is a dynamic and conflicted middle aged diary film, Guiding Fictions (5 minutes, 2002) contrasts city and country, Alone, Apart: the dream reveals the waking day (7 minutes, 2006) traces urban decay with hand processed 16mm film. 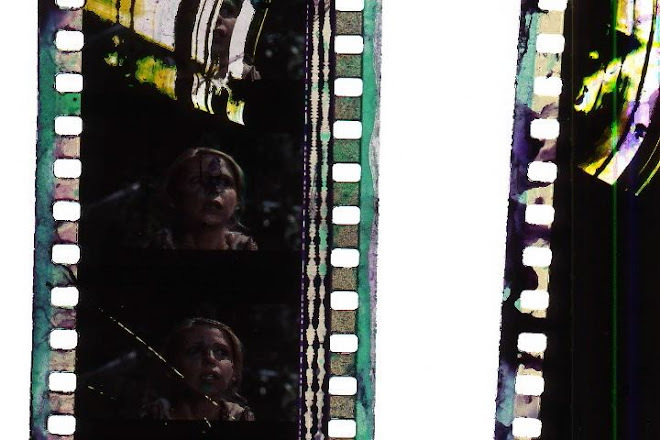 Blue Movie (2000, 5 minutes) and Trailer Trash (2008, 5 minutes) appropriate 16mm film detritus (foraged on the street) into sublime and surprising cinematic tapestries. Presented with Munchen/Berlin Wanderung (Oskar Fischinger, 1928)—a walk with a camera from one city to another—a between city symphony. "Hidden in Plain Sight and Guiding Fictions"